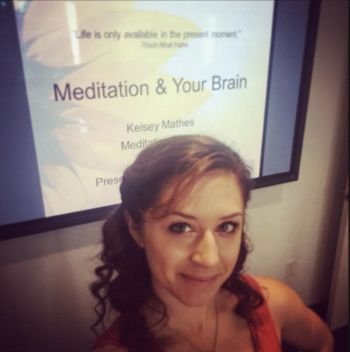 I offer nutrition and meditation services to groups and corporations looking to cut down on sick-days and burnout. Please contact me now for details on how I can help your business. Workshops can be customized to fit any time constraint and budget. All workshops include take-home materials for attendees. Below you can find a sampling of what I've done in the past. In this 90 minute intro, I'll cover the science of stress, how meditation can be a powerful combatant to stress, and the different styles of meditation. Attendees will leave with three (3) starter meditation techniques to try at home, and a discounted offer towards the Vedic Meditation 4-day course. *There are options for employers to subsidize part of the 4-day course for employees, and to host a 4-day Vedic Meditation course in-office. In this 30-minute drop in session, we'll cover a brief foundation of meditation and explore different styles of meditation. This is designed to be an on-going weekly offering for your office. In this signature workshop, we'll cover the foundations of healthy eating for your body type and I'll cover 4-easy steps to set yourself up for success. The objective here is to help attendees feel empowered and balanced around food choices, rather than a slave to the office "cookie-jar." Set up a series of 1-on-1s for interested employees that are 15 or 30 minutes long. Attendees will fill out a brief form prior to the session so we can tackle their biggest health concern in a short time. Each participant will leave with resources to get them started immediately. Available for half-day or full-day bookings. Are you looking to cut down on medicine and try a holistic route? In this interactive workshop, we'll explore the magic of essential oils (I use Therapeutic Grade Young Living Brand). These can be used in conjunction with Western medicine to improve physical discomforts and cleaning products in the home. Attendees will try different oils, learn about the different types on the market, and we'll raffle off a few products to take home. In this special workshop for Mommies and Mommies-to-Be, we'll cover the basics of what your body needs to stay healthy before, during and after pregnancy, both through food and gentle movements. Have a picky eater at home? We'll talk about how to sneak in more healthful foods, too! Additionally, we'll look at how to balance Mommy-time, with "Me-time," and why that's so important to staying healthy and balanced as a parent. *Note: Daddies are welcome at these workshops too! Are you hosting a conference or online summit? I am available for interviews and speaking engagements. Please Contact Me to discuss details.